Product prices and availability are accurate as of 2019-04-22 03:25:49 UTC and are subject to change. Any price and availability information displayed on http://www.amazon.com/ at the time of purchase will apply to the purchase of this product. The Champ's Story: Dogs Get Cancer Too! 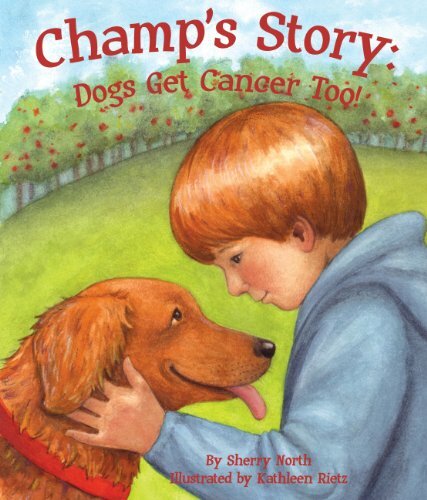 is a splendid book about a boy who discovers that his dog has cancer. The story focuses on how the boy handles cancer, what the treatments are like and how it will influence the dog, his family and his life. It also teaches us about cancer prevention and healthy habits. We hope that this book can be useful in informing your child about cancer, whether it in your beloved dog or within a family member. A young boy discovers his dogs lump, which is then diagnosed with those dreaded words: Its cancer. The boy becomes a loving caretaker to his dog, who undergoes the same types of treatments and many of the same reactions as a human under similar circumstances (transference). Children facing cancerwhether their own, a family members, a friends, or even a petswill find help in understanding the disease through this book. Medical writer and award-winning childrens author, Sherry North artfully weaves the serious subject into an empathetic story that even young children can understand. The For Creative Minds educational section includes: Understanding Cancer, Cancer True or False, Coping with Cancer & Chemo, Preventing Cancer When You Grow Up, Find the Healthy Habits. Additional teaching activities and interactive quizzes are available on the Sylvan Dell Publishing website. This book is the result of a partnership between Sylvan Dell Publishing and the ASCEND Foundation, a 501 (c) (3) registered non-profit with a track record of initiatives designed to make a measureable difference in the battle against cancer, one child at a time.